Review Fix chats with “Satanic Hell” creator Grigoris Douros, who discusses the series and its recent partnership with Alterna Comics. After two years on the independent comics scene, the series was picked up and can now be enjoyed by even more readers. “Red State” meets “Metalocalypse,” this comic will induce a laugh or two, but it will make you think as well. The seven-issues series comes out bi-monthly on Comixology, from Alterna Comics. You can find it at SatanicHell.com. Review Fix: What have you learned about yourself creatively from the series? Grigoris Douros: The team aspect of bringing a comic to life is something that I found I really enjoyed. Artist Kevin Enhart did an excellent job with the layouts and telling the story through illustration. And having solid lettering is something I now see as absolutely necessary, a job that E.T. Dollman rocks at. I also learned was how well I work with my brother Chris, who was the editor. Having a good editor is key for any writer and the script went through many beneficial revisions because of it. Overall, I would say my comic-making power level went up a couple thousand points. Review Fix: Why do you think this series is special? Douros: Satanic Hell does the metal and comics mix right. You’ve got this struggling metal band thrown into this crazy religious world run by the Christian Right. So yeah, there’s this ominous backdrop but that makes for great satire. It’s like Spinal Tap meets 1984 in Texas. I also think Jimmy Kerast’s haunting colors really make the story stand out. He’s amazing and we’re lucky to have him on board. Review Fix: Without giving too much away, how do things develop in the upcoming issues? Douros: Death Priest, Dante, and Exodus all have their own motivations for doing the tour of Texas, but as a group they’re all dreaming of succeeding as a band. Every artist would love to make a living from doing what they love and that’s Satanic Hell. Except their act didn’t get much attention in LA. Now they’ve got this tour in Texas that they’re banking everything on. So it needs to go well, but they’re walking into what ironically is going to be hell on earth for them. As the story unfolds, the role of Sam, their tour manager, becomes clearer and new characters jump into the mix, all of which essentially will be throwing a lit match into a powder keg. The fun is just beginning. Review Fix: Was the creative process any different for the switch to Alterna Comics? Douros: The series was basically done when Satanic Hell signed with Alterna. We finished it first because we wanted a regular release schedule. It’s hard to build momentum when comic book issues come out too far apart. So now Satanic Hell is arriving each month on Comixology as we hoped. Review Fix: How have they changed the comic? Douros: No content changes. Alterna is a great place for creators. Review Fix: How does it feel to be attached to a label now? Douros: Self-publishing is amazing. It’s so awesome to see the massive output of comics from around the world. It’s not just a world for the big two anymore. New small presses and creators are popping up all the time with interesting and diverse offerings. So why go with an indie publisher? I wrote about this on my creative culture blog at ZenoTelos.com, but there still are benefits to going with an established indie. Name recognition and greater exposure for one, and you can get great distribution options. Being up on Comixology is a big boost for example. And Diamond just allied with Trajectory this year to allow for global digital comics distribution on numerous platforms. Since Alterna Comics works with Diamond, Satanic Hell will get distribution through all these channels. That’s great exposure for the series and it saves creators a lot time so they can focus on making and promoting their work. So I’m thrilled to be with Alterna Comics and our whole team was happy with the news. Douros: I’ll narrow it down to the band, since it’s their story. I can’t choose just one, because each member brings a different element that I like. Death Priest is the cool and collected lead singer that keeps them moving forward. Dante is the more serious one who has his own agenda related to his past. I think a lot of people will love Exodus because he’s the clown of the band and is out for the rock’n roll show. Each of them has their own reaction to Texas too. As you see in the first issue, Death Priest is looking at Texas as a way to save the band, while Dante is frothing at the mouth to cause trouble. Exodus is hesitant because this isn’t the tour he was looking for – he was thinking more of tearing it up on the road like Metallica in the early years. Instead it seems he’s crashing into a church run by lunatics. Review Fix: Who do you think will enjoy the series the most? Douros: Satyrs and demons, definitely. People who enjoy dystopian fiction for sure. Metal fans without a doubt. Scott Ian of Anthrax will go bonkers once he gets a hold of this. Punk and rock fans too. Those who are skeptical of religious groups trying to force their world view on others will also enjoy the ride. Review Fix: What do you think the future will hold for the series considering the association with Alterna? Douros: If all goes well, I’d like to do a follow-up. For now though, the focus is on the present. It’s nice to have Satanic Hell alongside Alterna’s great lineup, including Billy the Pyro, Lilith Dark, FUBAR, and Empire of the Wolf to name a few. 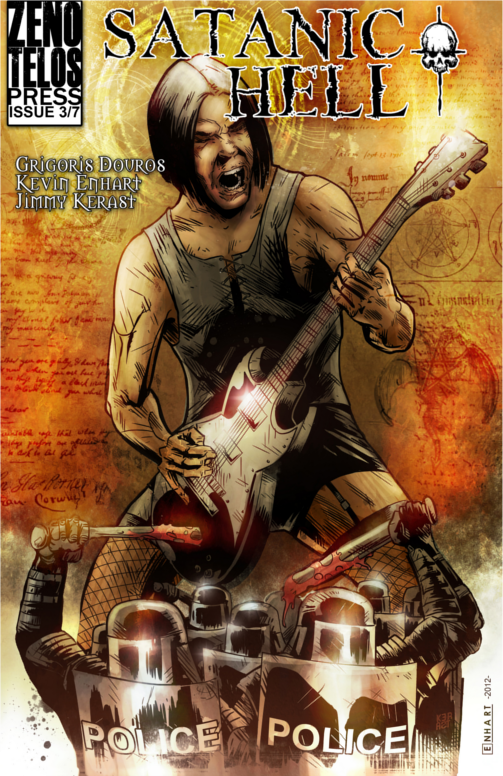 And now Alterna is making a movie of its graphic novel, The Chair, which is coming out next year and features a slew of cool actors like Rowdy Roddy Piper and Noami Grossman. So maybe I can get Hot Rod to play an angry reverend in a future Satanic Hell movie! Hah. Jack Black should play Exodus. Gael García Bernal could be Dante and Diego Luna for Death Priest. I think an animated film like the original Heavy Metal would be ideal. I’d settle for a short segment, though. If any studios are reading, shoot me a tweet.